Have been wanting to do chicken fried steak for quite a while now, so the wife said, "Hey lets make that for dinner for New Years"
The flour dredge and the batter. Did the flour, then the batter, then the flour again. Got these done and then went to start my disco up. This gave the flour time to really set well on the meat. 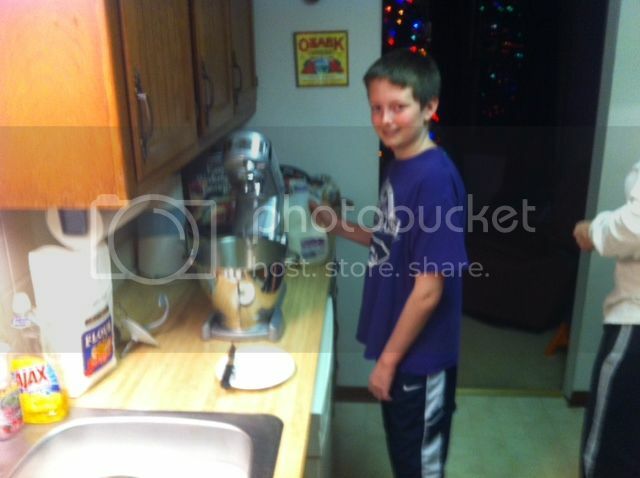 Trent was helping out with the mashed taters. Had the oil at 325* and set the first three steaks into the disc. 4 minutes on the first side and then a flip for 4 minutes on the second side. 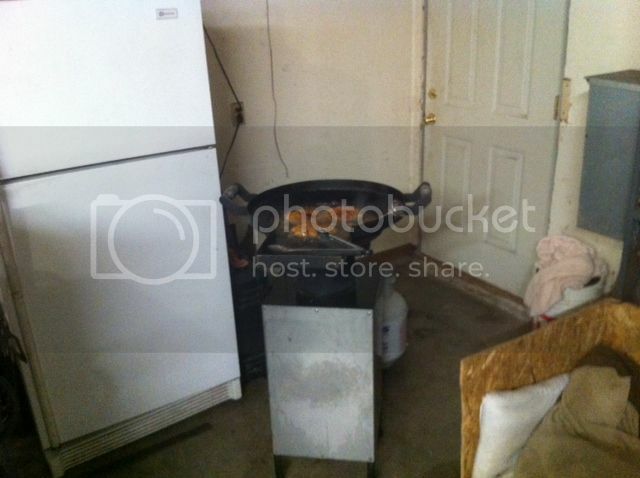 It was cold and rainy outside so I was cooking in the garage, didn't really want to put Robin's car outside, so I snuck up in the corner of the garage best I could. 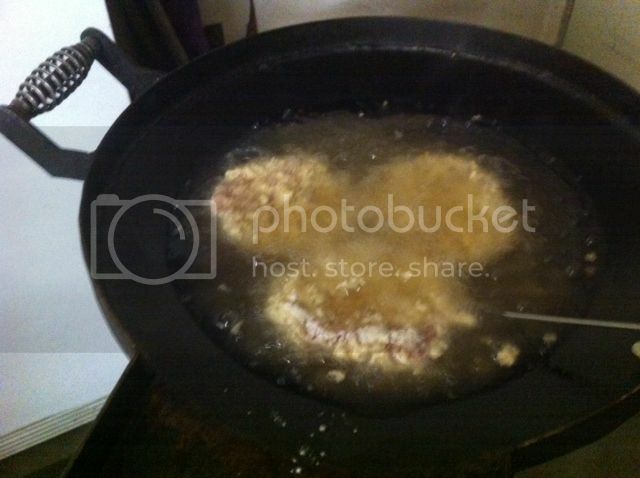 Once out of the grease, I put them on a pan with towels to absorb the grease and put the other three into the hot oil. 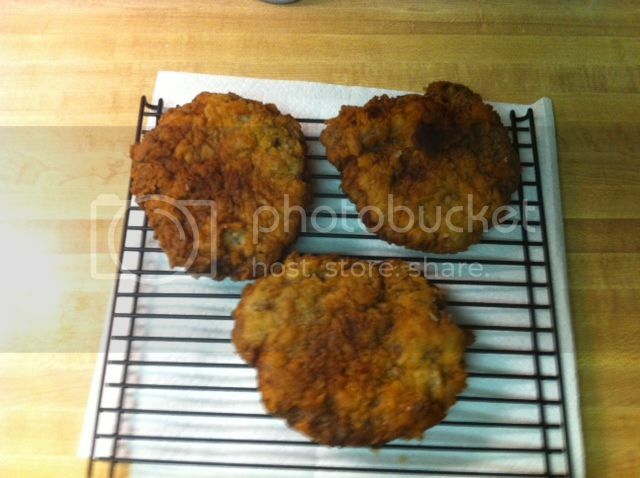 Then took the first 3 and put them on a cooling rack to sit and not soak up any of the grease from the towels. Trent finished up the taters and Robin put together some corn and country gravy on the stove. 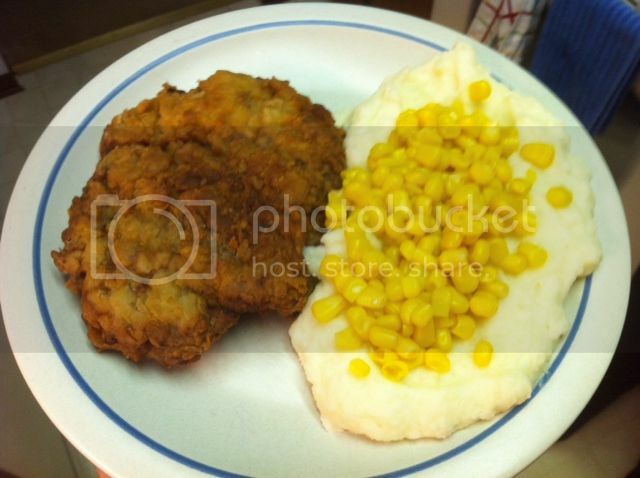 Yep, Im the weird one who puts his corn on his mashed taters. I cut this with a knife the first cut, then I just used my fork. These steaks were crazy tender and they were great! 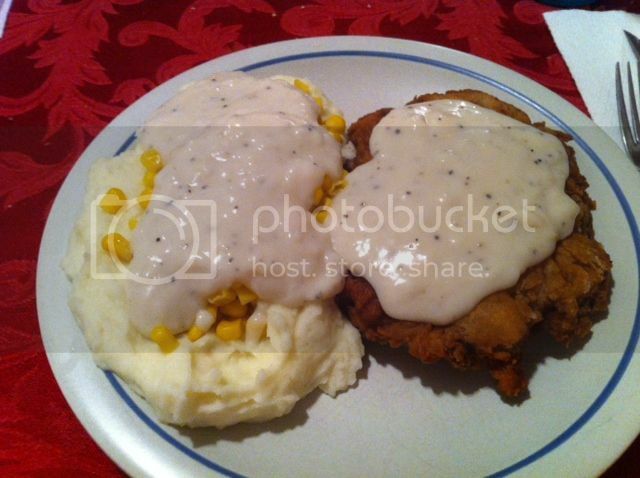 First time I have done chicken fried steak in the disco, but will be a repeat soon Im sure. ~Pound the steaks to around 3/8" thickness. ~Place 2 cups flour in a shallow bowl or pan. 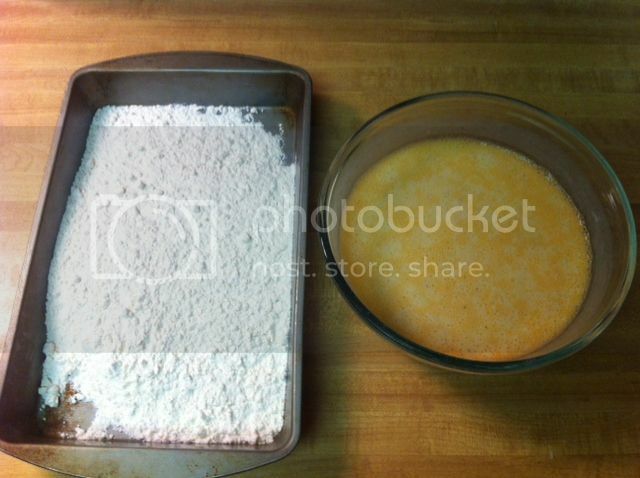 ~In a medium bowl, stir together the baking soda, powder, salt and pepper. Stir in the buttermilk, egg, Tabasco and garlic. 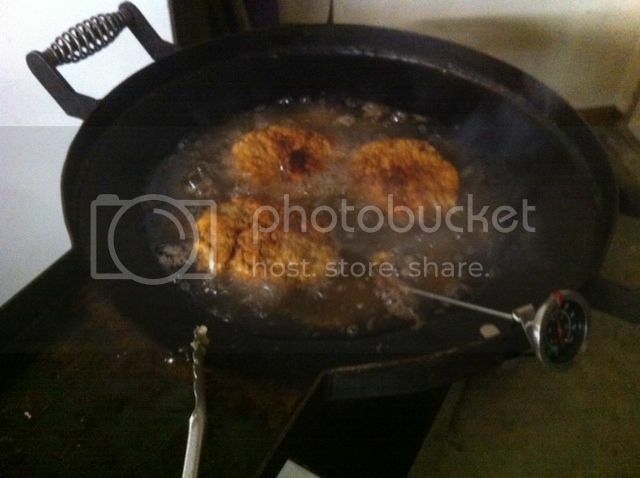 ~Dredge each steak in the flour, then in the batter, and then again in the flour. 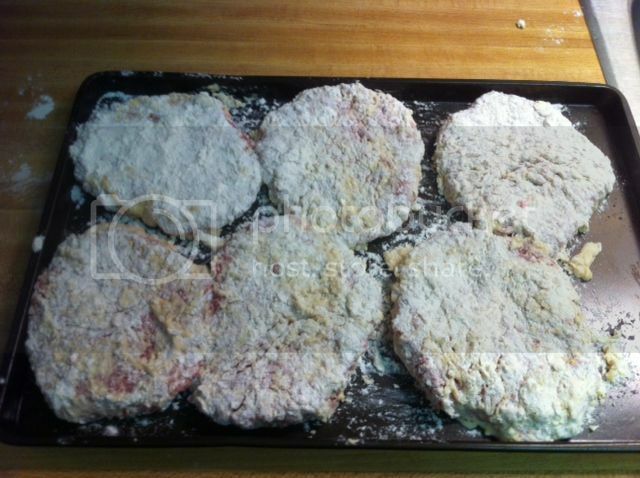 Pat the flour onto each steak so they are completely covered with dry flour. ~Put on a sheet pan and let sit 10/15 mins while oil comes up to temp. 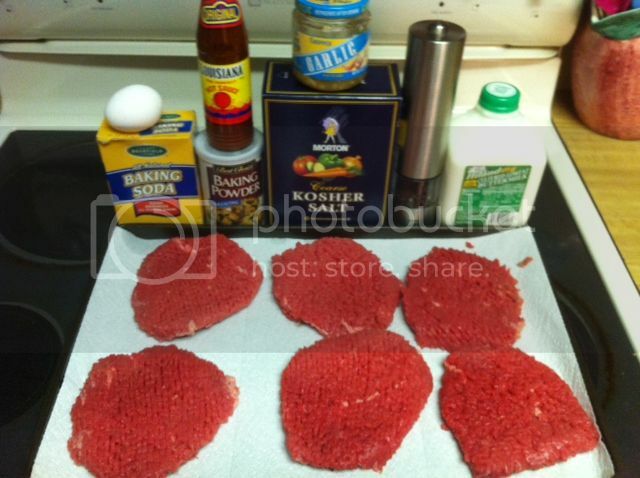 ~Fry the steaks 4 to 5 mins per side, then remove and place on a towel to absorb any oil. ~I then place mine on a cooling rack so the steaks don't start soaking up any oil from the towels and become soggy. Ahh.... 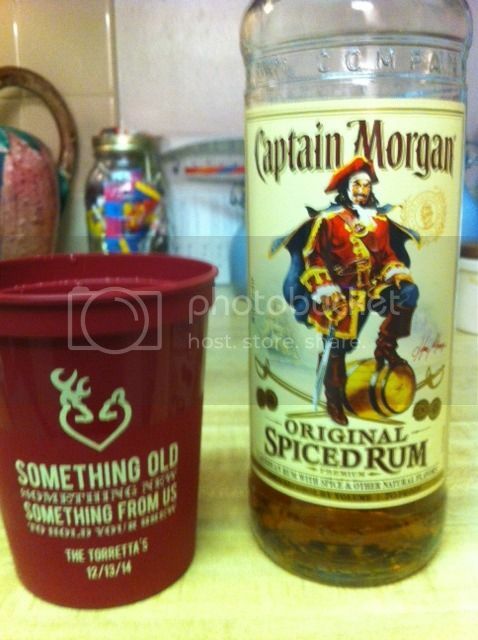 I see your cooking with the Captain. That looks like a must try .....Chicken Fried Steak in the discada.....all looks good Troy. 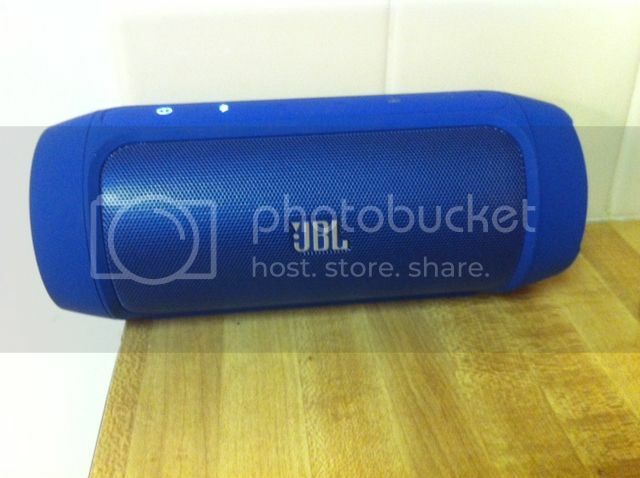 Those little bluetooth speakers really pump out some good sound for their size....I have two around the house. Awesome looking food you got there my friend!! Rick Thanks for looking bro. I am on a Captain kick right now, nothing wrong with a little boat ride with him, but have to watch out or he can get you ship wrecked in a hurry Give this one a go, you'll like it Im sure. Hadi, good to hear from you brother. 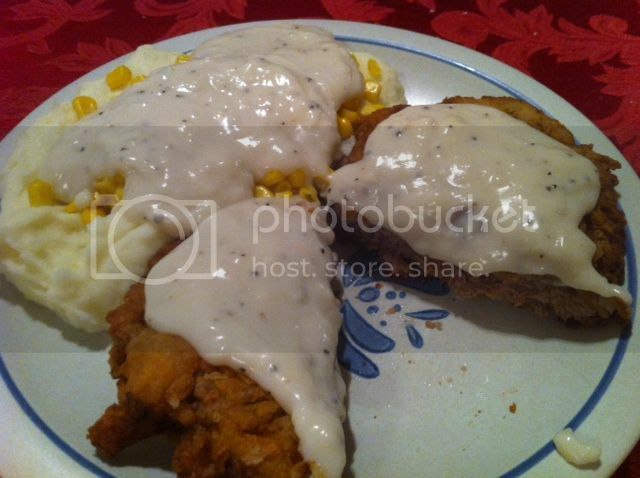 I love me some chicken fried steak as well! Would love to see your take on it sometime. That sure looks good! Now I want me some. Life is too short to eat wampum biscuits and drink cheap beer. Give me one of those with a half-stack on the side for tomorrow's breakfast. My usual order at the diner. I love to eat breakfast, but I hate cooking it.